Cramer & Anderson Partner Chris Sochacki has been named a Distinguished Leader among Connecticut attorneys. The Connecticut Law Tribune announced the honor March 23 as part of its annual statewide Professional Excellence Awards. The award, one of four for Cramer & Anderson attorneys this year, was based on a nomination letter submitted by Partner John Tower. Attorney Christopher Sochacki, who joined Cramer & Anderson LLP in June 2015 as an Associate, was recently named Partner of our firm for establishing himself as a Distinguished Leader on what remains the most important front for attorneys—helping people who have been wronged or injured. In a Personal Injury case other attorneys found too problematic to take on, Chris recently secured a settlement of $250,000. He also settled a 2017 Personal Injury case involving soft tissue damage from a low-impact, rear-end collision for an amount the mediator said exceeded settlements in nine of 10 comparable cases. In a sensitive 2016 case involving a child who was subjected to a traumatic situation, Chris obtained a settlement totaling more than three times what some Partners had estimated was possible, without filing a lawsuit. Outside the office, Chris is the only Connecticut attorney I know who regularly intubates unconscious victims of traumatic injuries, administers CPR to patients in cardiac arrest, inserts IV lines and administers intravenous medications, interacts with ER physicians and LifeStar personnel, and engages in lifesaving work on the front lines without fanfare or acclaim. He then comes back into the office and continues to fight for injured victims. Chris brings a rare combination of skills and attributes to the table—deep trial experience, extensive knowledge of traumatic injuries and their impacts on victims, medical know-how, good rapport with treating physicians, street smarts, an empathetic ear, and a strong work ethic aimed at achieving justice for our clients. I am very proud to work with him. In addition to Personal Injury, Chris’s civil litigation practice focuses on product liability, construction defects and medical malpractice, professional malpractice, workers’ compensation claims, employers’ liability and discrimination, and real estate errors and omissions. 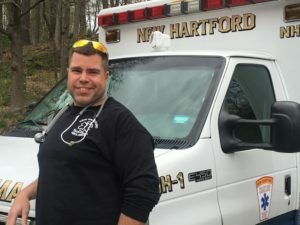 In fighting for clients in those Practice Areas, and in helping save lives in his “spare time,” Chris is a humble hero who leads by action, not by words on billboards or other forms of self-promotion. His strength of character, impressive and often unlikely outcomes, uncompromising drive to achieve optimal outcomes for those who need help the most, compassion, experience, and enlightened thinking are attributes that make Chris Sochacki a leader among Connecticut attorneys. Attorney Sochacki is joined on the list of winners by Partner Dan Casagrande, who won the Giant Slayer award, and Partner Randy DiBella, who was named one of the state’s Best Mentors. Additionally, retired founding partner Henry B. (Hank) Anderson, who lives on Cape Cod and turns 100 this May, is being honored with a Lifetime Achievement Award. This year’s honorees will be recognized at a May 24 awards dinner at the Bond Ballroom in Hartford. The CLT’s Attorney of the Year winner will be announced at the dinner. The 2018 awards add to the firm’s growing list of Connecticut Law Tribune Professional Excellence Awards. Attorney Tower won a Distinguished Leaders award in 2017, and the same year Attorneys Abigail Miranda and Josh Weinshank won New Leaders in the Law awards. Attorney Lisa Rivas has also won the New Leaders in the Law award. Attorney Sochacki’s civil litigation practice focuses on personal injury, product liability, construction defects and medical malpractice, along with professional malpractice, workers’ compensation claims, employers’ liability and discrimination, and real estate errors and omissions. He works in the firm’s Litchfield office, and may be reached by email at csochacki@cramer-anderson.com and by phone at (860) 567-8718. In addition to the Litchfield office, Cramer & Anderson has offices in New Milford, Danbury, Kent, Washington Depot, and a new office in Ridgefield, serving Fairfield County. For more information, see the website at crameranderson.com or call the New Milford office at (860) 355-2631.